The borders between materials and those related to sculpture and their surroundings are some of the central interests in the new series of works by Frida Baranek. This equation between matter and space is inherent to sculpture in its historical perspective; from antiquity to the ephemerality of the installations made in the last fifty years, showing a three-dimensional art object has always been configured as a tensioning between scales, colors and materialities. 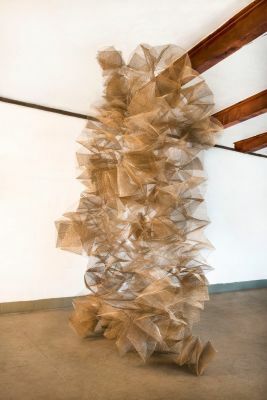 For anyone familiar with Baranek’s artistic path, the three-dimensional language is certainly one of her key interests and the basis on which her career has developed for more than three decades. In her work, the use of industrial materials is a constant, and they are always twisted and affected by the scale of the human body. Iron, metal and steel are used in the format of sheets and extended or tangled wires. The contrast between these industrial materials and others from a more organic sphere – such as wood and stones – has been notable since Baranek’s first works. Formally, it seems that the artist tends to use the emptiness of the artworks’ surroundings as a compositional element, while also following a line of research concerned with accumulation and excess. As aptly pointed out by Roberto Conduru, the artist’s poetics has to do with the popular term bololô – that is, an amalgam of elements, a confusion of encounters that gives rise to a sometimes opaque materiality. Some of the other artworks presented here for the first time are installed directly on the wall and remind us that opacity is also a constant characteristic of her research. These artworks are intriguing due to their contrast with other materials that have been part of Baranek’s repertoire – wood, iron and colored acrylics are added and transform her sculptures into essays on form. The folds made by the artist not only structure these works, but also create the rhythm that we perceive in their movement. The repetition and singularity of each of these folds echoes the gestural acceleration that was necessary for their conception. CONDURU, Roberto. “Corpo como lugar, arte como exílio” in Frida Baranek. Rio de Janeiro: Barléu Edições, 2014, p. 13.